RECESSION Builds MOMENTUM: Frightening STUFF! Earnings season is nearly over, along with the midterm elections, and now we need to see how the U.S. government functions in one of the most hostile political environments we’ve witnessed in decades. As opposed to the Great Depression or the Great Recession, America isn’t digging itself out of a hole; yet, tens of millions of people are stating that their financial situation isn’t better off than in 2008, 2012, or 2016. In other words, whatever growth is made in the economy, as a whole, is offset by rising prices or by the complexity of modern living. The fundamental problem is affordability. While wages have been, pretty much, stagnant, since the 1990’s (even the 1970’s for some professions), home prices cost much more than they did back then, doubling and tripling in some regions. Secondly, when prices were affordable, banks were strict on lending, so many didn’t lock in prices when they were within reach. 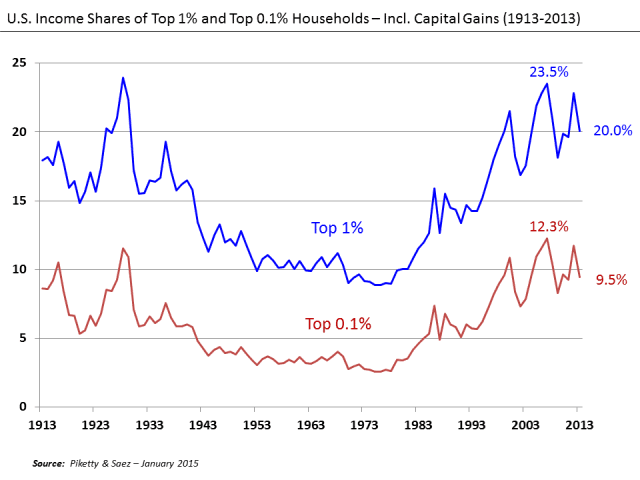 Ten years of prioritizing the wealthy, via QE programs, which solved many liquidity issues for the federal government, allowed the stock market to flourish and gave Corporate America the chance to expand, meant little for fixed-income earners, who are the overwhelming majority. These centralized policies had a horrible impact on the middle-class. This isn’t a healthy formula for a nation, since it can become self-perpetuating. The richer the upper-class gets, the more it can make itself isolated, by sending its children to better schools, by safeguarding its businesses, through sophisticated tax shelters and by allowing its investments to grow alongside active income activities. World War II changed the course that the U.S. was on in the late 1930s, by making it a robust manufacturing hub. The middle-class was born. Today, the U.S. needs to think differently, as a country, since its ability to compete on price with the rest of the planet is non-existent, when it comes to most products. America must compete on quality, by becoming a center of excellence. Its Millennials generation must grab the bull by the horn and charge ahead, or face massive austerity measures, imposed by the government, in their attempt to tax the population and meet obligations. The reason it is so tricky to pull America out of its present predicament is that everything this republic does is based on the power of the dollar’s reserve currency stature. Take this away, and you’ll watch it dig itself deep in the ground, fighting for survival. Americans have little to no savings. They absolutely put their fate and faith in the ability of Washington to pay for Social Security, Medicare, Income Security, food stamps, and a myriad of other subsidies. Lack of financial education didn’t stop the birth of the middle-class in the days following the 2nd world war, since most people worked in one profession throughout their lives, but today’s economy requires people to re-train constantly, to gain new skills, to switch their mindset, and to adapt to new circumstances, on an almost yearly basis. I am currently at New Zealand’s North Island, one of the last pieces of land discovered during the imperialistic period of Europe. A Dutch seaman named Abel Tasman reached the South Island in 1642, which was inhabited by the Maori, Polynesian descendants, who came in some 800 years ago (the 13th century). Discovering new land led to the creation of fortunes for the conquerors, as they plundered the resources, taxed the population, increased global trade, and found new opportunities. Being first to control real estate rights and other key infrastructure is next to impossible today. There are no undiscovered lands – being first to a new geographic region is a relic of the past. Today, the name of the game is organizing existing societies, communities, cities, and nations to maximize their potential. Singapore is a perfect example of that. China’s transformation in the past 40 years is, arguably, another. 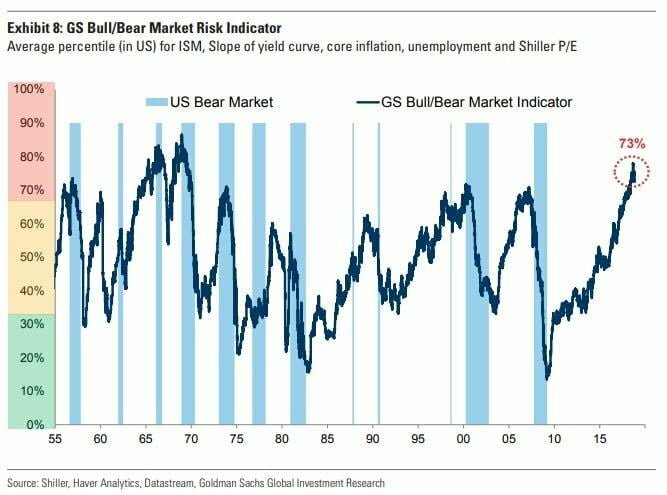 The Goldman Sachs Bull/Bear risk indicator is one of the best ever devised. It predicts market crashes and recessions best. Currently, it is telling us that our days are numbered. In New Zealand, the way it was originally found, only birds were native. Bushes covered the entire island. Today, some 4.8 million people reside here, along with over 30 million sheep. There are countless cows, pigs, and other wildlife. Wine is made here. Kiwis and apples are grown. Deer is a major export, along with wool and dairy products, and tourism is a major economy. As aviation improves, more direct flights will reach here, making it an even more accessible destination. The tides of opportunity ebb and flow all the time, throughout our lives. This land, which was a giant forest 300 years ago, is becoming an adventurous tourism spot, a dairy product (milk) empire, and a place where plenty of land is still unspoiled. In Waitomo, for example, glowworms light up dark caves. The two men, who discovered the caves 125 years ago, have monetized this attraction brilliantly, drawing in the crowds, who come in packed buses. Some professions are vanishing away from our planet, while machines, software, or cheap labor cannot easily replace other ones. Some skills are still coveted and in high demand. Be on the path that does enjoy the prosperity the world is growing into because the wealth gap will not be resolved soon. It will persist. Think globally. In today’s world, moving to another region is not a big challenge at all. As always, I urge you to specialize, by focusing on a major goal, because concentration provokes a high level of alertness to opportunity. Bitcoin Extremely Cheap – Perfect Entry Point! Top Cryptocurrencies and Exchanges CONTROLLED BY THE FED: Bitcoin is NOT ANONYMOUS!